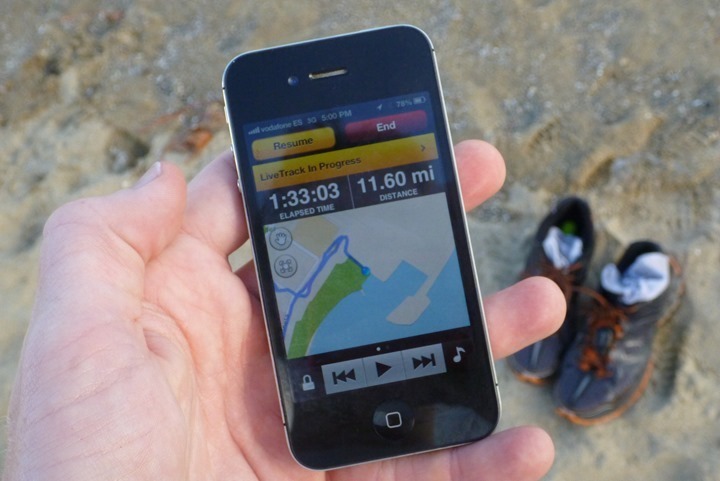 But I’ve been thinking lately about what apps are out there that offer live tracking while you’re out there running, cycling, or rambling around. But in particular – apps that also live transmit sensor data – such as ANT+, Bluetooth, or Bluetooth Smart. I thought it might be interesting to put together a post on all the options you have. I quite often use the Garmin Fit app which has live tracking of both position, as well as ANT+ sensor data – including Power, Heart Rate, Speed and Cadence. And in general, I find it works pretty well. But I know there’s more. For example, Runkeeper has some functionality (that’s even used by other apps too). As well as Endomondo. But I know there’s many others out there I’m not aware of. The app landscape is just that big. So over the next 3-4 weeks as I’m on near nonstop travel around the globe, I’d like to test out different options and will include them in a compiled post with all the pros and cons of each. 3) Must include some ANT+/Bluetooth/Bluetooth Smart sensor data (i.e. HR/Speed/Cadence/Power/etc…). That’s all. Free app or paid app, either is fine. Service fee or no fee, both ok.
From a platform standpoint, I’ve got iPhones, Android phones, Windows 7 and Windows 8 phones – so I can toy with just about anything (except Blackberry…sorry!). So – let me hear about them. The more the merrier! And, you’re experience with them is even better. Has anyone got the live tracking feature to work. I got my smartphone set to tweet when my workout starts but on the link to the website says that the user is not live tracking even though I have it set to do so. thought it would be a good safety feature. Not being tech savvy at all could you help me understand this better? What device does the cyclist have and how does say my wife at home track me? I just tried to use Mapmyride again after an absence, and after wasting another couple hours of my life this morning, i now remember why I deleted it from my phone and favourites. The live tracking, once so easy, is a real PITA now. Also, the elevation data is so wrong it's laughable. Even if you have elevation data, it scrubs your data and uses it's own erroneous data source. I was searching for a ride for this weekend to plug into my Garmin. I knew the elevation data was something like 4000 feet of climbing, yet mapmyride said 1500ft, i finally find other plots on bikely and ridewithgps, who correctly report 4500'.. Seems MMR works with iPhone and android mobile devices, and used in conjunction with a home computer you should be able to get the device to "live track" whomever has the associated mobile device. 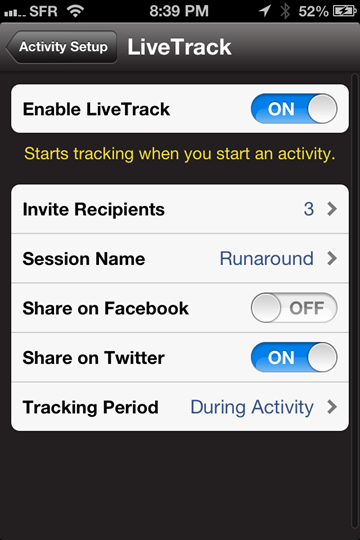 You have to be sure you set your profile preference on the computer side to "public, share with everybody", then you activate the record workout on the mobile device and choose the live tracking in script. At least it's supposed to work. Last weekend I headed out for a nice 40 mile ride and I set the iPhone appropriately. I told my wife to refresh the page that had the live tracking and watch how fast I roll. 35 miles later I called to see how it looked and she told me that the live tracking said it was working (live tracking), but that I hadn't left the driveway yet! No idea if the elevation is correct, I live in southern NJ where we don't have hills but the program is essentially a PIA. I'm not at the point where I'm giving up on it yet, but I am close. Problem is that I really could use a tracking program, so I really want this to work. Will try again this weekend. Great info but one quesstion. Are you sayin that this service is with iphone or android only? I looking into ways to do live tracking without having to pay $500 for a new garmin plus purchase a new phone. I don't have a smart phone but would be willing to purchase one as ny dumb phone is quite old but can't afford to alos add $500 garmin to the mix. Pardon my ignorance but I don't understand. My friend has the 810 and uses strava so is his garmin sending me and his invitees his ride info or is his smart phone sending it thru a strava app? Is it duplicating? Why have both? I understand that the garmin wont send his ride info without the bluetooth enabled smart phone but what I hear here is the smartphone don't need the garmin, just a strava like app. His info is updated every 60 seconds. I have an i phone and I use findmyfriend. My wife can check my location and it is reasonably close. Best part....free!! new version (should be available next week) will include sharing for facebook, twitter. We've listed at least four different functions. Electronics, Lighting, & GadgetsHRM, GPS, MP3, HID. Whether it's got an acronym or not, here's where you'll find discussions on all sorts of tools, toys and gadgets.